Felton bulls were in excellent condition and ready to go to work for bull buyers. 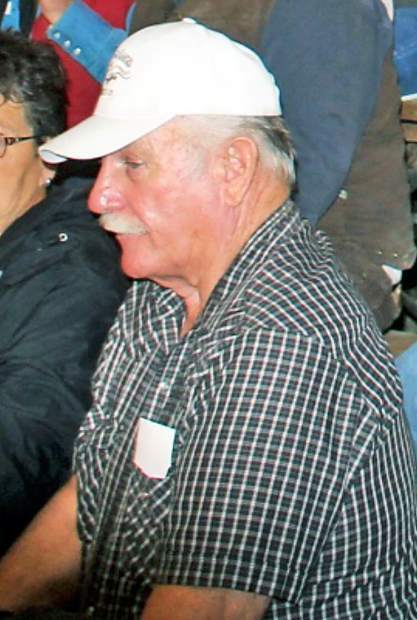 Volume buyer Ed Draper of Red Lodge, Mont., was in the seats again for the 42nd Annual Felton Angus sale. Dudley Shy of Billings, Mont. has been a longtime volume buyer of Felton bulls. 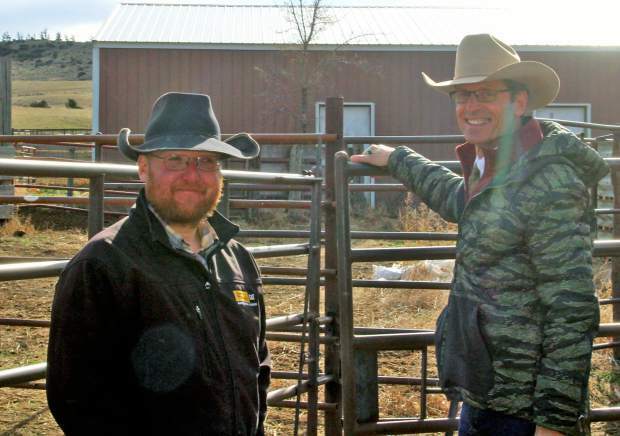 Jim Felton and Roger Jacobs getting ready for a record-setting Felton Bull Sale. 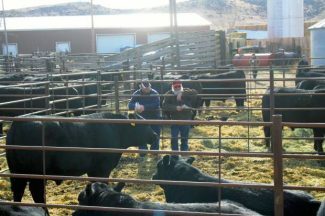 Reported by: Andy Swenson for Tri-State Livestock News. For the first time since I can remember they were actually talking about it raining on the day of Feltons' Sale. Yes, raining in February! Usually its snowing on this day, but It was a beautiful day and it did rain a little after the sale. What a great sale it was. The sale barn was standing room only, and you could just feel the excitement in the air to get that first bull in the ring. I compliment the Feltons on the look of of the bulls, as they were in great condition and walking through the pens, the docility of the bulls, especially the 2-year-olds, was just astounding. 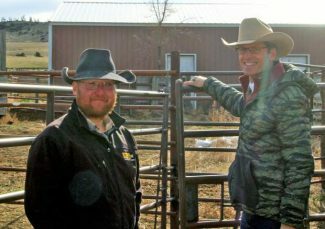 My hat is off to Jim, Richard and the Felton crew for having the bulls in great shape and for having one of the most uniform set of bulls I have seen so far this sale season. The fact that the Feltons have been in the bull raising business for more than 40 years is testament to the kind of bulls they raise. Their bulls continue to perform in all types of environments across the country. Bulls in this sale sold to 10 states and to a great number of repeat buyers. I want to give a great big shout out to the gals from the Park County Cattlewomens for making such an awesome sale dinner and the homemade pies I could have foundered on. Thanks again Jim, Richard and family for the great time and a great sale. Topping the sale was Lot 8, Felton In Focus T369. This very powerful coming 2-year-old bull had a big top, depth, length and the look of a solid herd bull. Many took notes on this bull in the pens, but when the gavel fell, Ray Russell of White Sulphur Springs, Montana, was the winner with his $12,000 bid. This Mytty In Focus son out of an Iditarod 427 daughter posted EPDs of BW +2.9, WW +51, Milk +20, YW +96 and NR of 103, and YR 120. Lot 4, Lot 5, and Lot 6 each sold for $11,500. All three of these bulls are impressive Apex Wide Track 4401 sons with a lot of carcass merit. The Lot 4 bull was out of a Bairds Really Windy 23 daughter and posted EPDs of CED +1, BW +2.9, WW +54, Milk +22, YW +107, and $F 65.77. This bull's actual birth weight was 88 pounds with a 205 Wt of 602, NR 100 and YR 122. 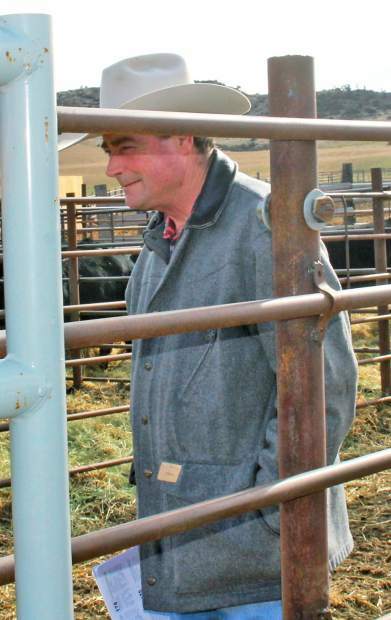 Long-time seed stock producers Forgey-Smith Angus of Douglas, Wyoming, purchased this bull and I am sure he'll be siring many other herd bulls in the years to come. Lot 5, Felton Wide Track S63, is out of a Halmark 2556 cow, which is a great cow family going back to Hoff Head of the Class SC534#. Performance shined through in his EPDs posting a +109 YR, 115 YR and 66.52 $F. This big and deep ribbed bull is headed to another great seed stock producer, Hyline Angus Ranch of Manhattan, Montana. Lot 6, another impressive Apex Widetrack 4401 son, sold to Ray Russell of White Sulphur Springs, Montana. This calving ease sire has the making of a true herd sire and is backed by a strong cow family – HARB Pendleton 765 J H. His dam's production was 1 WR 108 and 1 YR 101. This two-year-old posted EPDs of BW +2.0, WW +62, Milk +25, YW +104, $W 45.11 and $F 55.70. Rounding out the top 5 selling bulls, was lot 229, Felton Confidence 3F3, selling for $10,500. This Connealy Confidence 0100 son, a big time herd bull prospect that calved Sept. 8, 2013 with only a 62 pound birth weight and had a 205 wt. of 739 pounds. He was one of the most complete and smooth made Confidence 0100 sons offered so far this season with a ton of calving ease. He posted EPDs of CED +15, BW –1.5, WW +56, Milk +28, YW +86, $W 54.17 and $F 30.82 with a NR 107 and YR 97. His dam, a Felton Bottomline T881 daughter, has a WR of 107 of 1 calf. This bull is headed to S&L Sheep Ranch Inc., Alzada, Montana.